Nothing screams summer quite like the classic Pink Lemonade. It was the soft drink of choice during the summer holidays on days out (it was far too indulgent to have on a daily basis) and even now evokes memories of halcyon days. 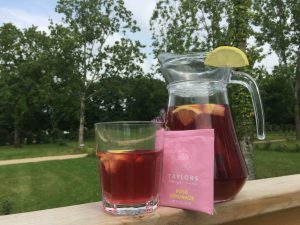 Always good for a twist on a fruit tea, Taylors of Harrogate have introduced a Pink Lemonade tea into their collection. Not only is the packaging truly delightful, but the subtle taste and smell (oohhh, the smell that fills my cupboards is truly UH-MAZING!) is incerdible. Now the sun is shining and BBQ and picnics are a go, it’s nice to enjoy a refreshing drink that isn’t the usual fizzy variety; I stopped drinking fizzy drinks beacuse I am conscious of the amount of sugar (or Aspartame) in each one, and am always looking for an alternative to water, and I’ve only gone and found it, and boy is it delicious and a grown up alternative to the classic Pink Lemonade. Sit in the sun and enjoy!! We would love to hear what your favourite flavour of Iced Tea is, let us know via Instagram or Twitter! This post is not affiliated with Taylors Tea, I am merely a fan!